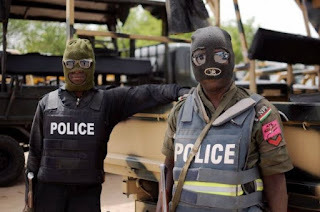 The current crime reports have it that the two of the FAKE Policemen that invaded the residence of Chairman of the Irepodun/Ifelodun LG area of Ekiti State, Dapo Olagunju to ABDUCT him were arrested. The TWO FAKE POLICEMEN are now being interrogated at Igede Ekiti Police station. One of them has confessed that they were sent by Fayemi’s Chief Thug, Deji Adesokan (Jaru).